Temple length is one of three important measurements required to order eyeglass frames that fit properly. Temple length applies to the part of the frame that rests on your ears. The other two measurements are bridge size and lens size. All three are measured in millimeters. 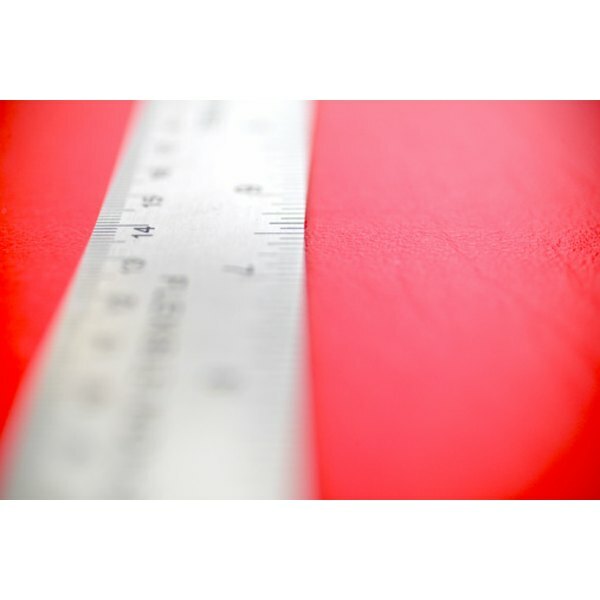 To properly measure your eyeglass temples, you will need a millimeter ruler, also called a PD stick. Try on eyeglass frames until you find one that fits properly behind your ears. Temples are adjustable, so keep that in mind as you try them on. The ideal fit is for the temple to bend at the top of your ear and follow the curve of the back of your ear. The best-fitting temple is one that stops slightly above your earlobe behind your ear. If the temple comes past your earlobe, it is too long. Remove the glasses and look at the temple. Most frame manufacturers stamp or engrave the temple size on the temple. Average temple lengths range from 130 to 145mm, according to Opticianworks.com. However, lengths can range from 120mm to 170mm. Measure with a ruler by straightening the temple at the bend so the length of the temple is completely straight. Be careful not to break the temple when you bend it. You can heat the temple by soaking the frame in warm water for 10 to 15 seconds to make it more pliable. Lay the ruler at the end of the temple and measure the entire length. Standard temples are plastic or metal and designed to have a permanent bend over the ear. A less common type of temple, called a cable temple, is made from a flexible metal and curls around the ear without adjustment. To measure a cable temple, simply extend the entire temple and measure with your ruler. Bending a temple to measure it may cause it to break. If you are unsure of the durability of your frame, take your glasses to your eye-care practitioner. Most opticians will measure your temple for free.